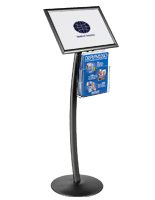 This menu holder is an ideal sign stand. The aluminum construction along with the black finish makes this poster display suitable for most any type of commercial environment. 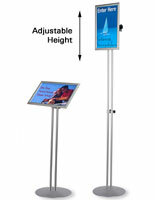 This display stand, menu holder provides advertisement space for showcasing any company's advertisements. The 17" x 11" size is a convenient size; allowing users to create and print signage right from the company printer. 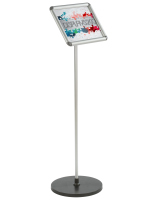 This graphic display stand or other menu holder is commonly used in such settings as restaurants, banks, retail stores, and shopping malls. 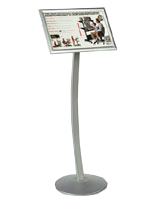 Use this sign stand in a restaurant or lobby to indicate instructions for seating. 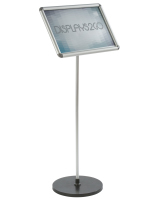 This menu holder features a non- glare clear lens and a black metal finish. The lens helps to protect the signage from dust and debris, as well as minimize the negative effects from the overhead lighting. 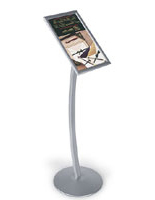 Each menu holder also features "snap-open" sides that make graphic changes not only quick, but easy! Simply lift each side, place your print behind the lens, then snap shut the frame sides to keep your graphic in place. We provide this menu holder with the necessary instructions for assembly. There are also specialists here that can assist users that need some extra help. 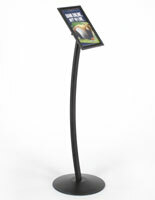 This menu holder is shipped unassembled, saving money on shipping and labor. There are essentially only three components to this sign stand. 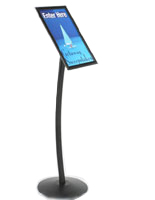 Upon arrival, each menu holder can be easily constructed in a matter of minutes. I ordered this sign for a trade show. It's sturdy and holds the signs well. Easy to change to the signs as well. Love it - great sign for the money! The product well passes our expectations. These will be very easy to use, and they are very sturdy as well. Thank you for the review, Carl. If you are planning on ordering from us again, feel free to like us on Facebook; we offer various social media-exclusive discounts and deals that you may be interested in for future orders! I am using the stand for something a little different, I am using it for my Show car, to provide information to the show goers, the stand was delivered fast, it came in without a singe scratch and ready to use, i would put this stand up against stands that cost 3 times more, Very happy. What a great idea, Mike! And thank you for the review! This sign is a fantastic addition to our welcome team for our church. We have four of these signs now and they are awesome for anything we need. The snap frame is sturdy, the pedestal base is heavy enough to hold the sign, but light enough to move with ease. The matte sign cover is clear and protects our signs. Any 11"x17" paper sign works well. We have even used these stands for signup sheets. The only critique I have is that the screws in the pedestal base sometimes come loose (not completely undone), so that the base and the stand wiggle, which can be annoying. I suspect some screw glue may work well to remedy this.